Hello and welcome to Monday. Here we go again. It's a PAY ATTENTION week. 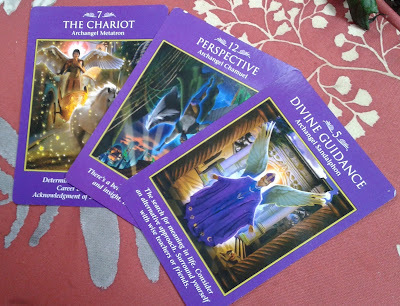 As always, the meanings are open for interpretations beyond my own, so please feel free to comment as your week unfolds and how the cards relate to you. All of the cards this week are major arcana cards. Archangel Metatron, who is not a nice guy on the tv show Supernatural, is more pleasant to us this week. Surrounded by guiding light, your week starts off with career advancement. It's good to acknowledge the success of others as more is accomplished as a team. Midweek brings us Chamuel who wants us to take a moment to put things into perspective. Try to see others point of view. Things are kind of topsy-turvy but you can set things right if you have a mind to it. The week winds up with some divine guidance from Sandalphon. Searching for the meaning of life? Maybe it's time for a metaphysics class. Or beer with a buddy to try to figure it all out. The meaning is not as important as the journey at the end of the day. Sometimes it's easier just to accept and move forward than to dwell on things you cannot change.